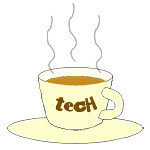 laptop « Tech bytes for tea? Fujitsu has introduced the new Windows 8 LIFEBOOK CH702 for the Asia Pacific region. The Ultrabook will be available in early December for S$2,388 (incl GST), in white, pink and brown. The Fujitsu LIFEBOOK CH702 comes with stylish design and accessories. The new Fujitsu LIFEBOOK CH702 comes with stylishly designed accessories which include a matching wireless mouse, a set of PC case and pouch, and an elegant, slim adapter. The Ultrabook comes with the 3rd Generation Intel Corei5 processor with Intel Turbo Boost Technology and the latest Windows 8 operating system to provide an efficient and powerful performance machine. The 13.3-inch Ultrabook weighs approximately 1.45kg and is 17.5mm thick. Boasting more than 7 hours of battery lifespan, the laptop is powered to provide full day usage for users on-the-go. The CH702 is pre-installed with Fujitsu’s new proprietary software, Diary and Scrapbook. Matching mouse colours with white, brown and pink. These are convenient, fun and original applications that let users organise tasks, announce important updates, enhance photos, collate interesting information, and share on social media platforms such as Twitter or Facebook. “Customers are looking for design elegance without neglecting PC performance. This demographic is a big market for us,” said Mr. Lim Teck Sin, Vice President, Product Marketing and Engineering, Fujitsu PC Asia Pacific Pte Ltd.
Scrapbook stores and organises pictures and Web pages that users come across when they are browsing the internet. The application allows users to create theme-based collages for saved content such as web captures. Content can easily be managed and shared with friends as a digital scrapbook. With Diary, users can create their very own journal by storing and organising Facebook and Twitter posts and downloaded photos. PC case and pouch included. Images not to scale. Incorporating stylish touches, the CH702 features a pearl-design power button, elegant keycap finish and a delicate, cubic zirconia embellishment. The top casing has been constructed with an elegant gradation with gold trim, featuring a cubic zirconia embellished flip latch that allows users to easily open the display panel. The power button is adorned with a pearl-like accent, and the power status LED and Caps Lock keys are decorated with a LED light with diamond-cut surface. An exquisite gold ring frames each key on the keyboard, highlighting its elegant style. In addition, the outtake and intake vents all feature a floral motif design. Each CH702 comes with a matching wireless mouse that is shaped like a pretty compact powder case; a PC case and adapter pouch with pearl charm; and a slim, bejeweled AC adaptor. Other accessories which users can purchase include the light and compact external Optical Disc Drive and USB/LAN adaptor for enhanced connectivity. How do you maximise your battery life? Should you constantly charge your battery? Should you keep your battery installed even when your laptop is plugged in? When should you replace your battery? Check out Lenovo's Guide to Laptop Batteries. 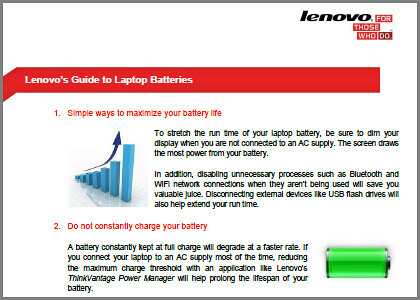 Here are the answers to these and other frequently asked questions, courtesy of “Lenovo’s Guide to Laptop Batteries”. 2. Keep your battery installed even when your laptop is plugged into a power source. 3. Do not constantly charge your battery. Reduce the maximum charge threshold if you connect your laptop to an AC supply most of the time. 4. When storing your extra battery, ensure there is at least 50% charge level, and store in a cool environment. 5. Keep your battery cool when in use to slow degradation. 6. Modern Li-ion batteries do not need to be fully charged and discharged because they do not suffer from memory effects. 7. A little obvious here – replace the battery when it can no longer hold a full charge, or when its actual run time falls significantly below its original run time.